Irish Wolfhound Deerhound "by Sir Edward Landseer"
Home > IRISH WOLFHOUND TREASURES > Irish Wolfhound Deerhound "by Sir Edward Landseer"
"The Death of the Stag" by Sir Edward Landseer. Image size about 7"x10" on 9"x12". I believe the age is 1851 and it is in fairly good condition for an engraving of this age. 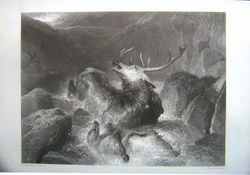 Landseer is very collectible and he created many images of Irish Wolfhounds, Stag hounds, Deer Hounds and other animals. He created many images of Stag Hounds in the Hunt, this one depicts the tragedy of the hunt. The detail in the engraving is very nice and the ink is dark. The paper is still strong and has only a little yellow tint which is typical for paper from this period. A wonderful piece for a collector.